WEEE Ireland today announced that they will charge on with their electrifying fundraising partnership with LauraLynn, Ireland’s Children’s Hospice. Their renewed commitment for a further 5 years will see them donate vital funds to the organisation as an incentive for the recycling of waste batteries until at least 2022. Alongside WEEE Ireland CEO, Leo Donovan in announcing the partnership was LauraLynn Head of Fundraising Sarah Meagher, who accepted a donation of €50,000 thanks to the mighty recycling efforts of householders throughout 2017. Last year, WEEE Ireland collected 874 tonnes of waste batteries, surpassing 2017 targets. That’s equivalent to 43,700,000 AA batteries! 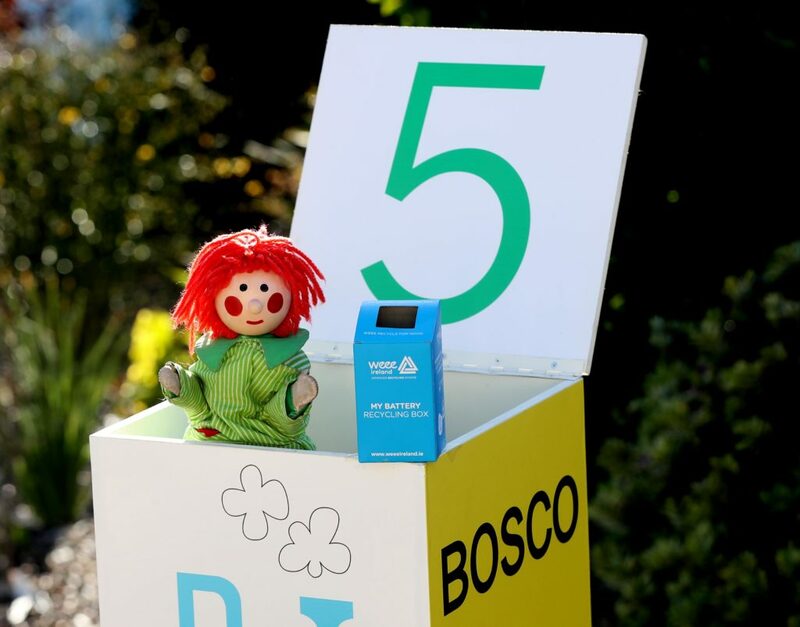 The 2017 sum brings WEEE Ireland’s overall donation to LauraLynn to €335,000 since the partnership first began back in 2011, powered year-after-year by the households, businesses and schools across Ireland returning waste batteries – with the help of campaign ambassador Bosco! Over the same period, WEEE Ireland has recycled an incredible 4,209 tonnes of waste batteries. WEEE Ireland’s EU battery recycling target is to recycle 45% of waste batteries placed on the market annually in Ireland. As householders use more and more batteries in small electrical appliances this means every battery recycled in a WEEE Ireland blue battery box is more important than ever before. This renewed partnership with LauraLynn takes the ability to make a difference beyond the blue box and puts it into the hands of every householder and consumer. WEEE Ireland’s donation to LauraLynn, Ireland’s Children’s Hospice, helps them to deliver invaluable hospice care and emotional, social and spiritual support for children with life-limiting conditions and their families. More than 3,800 children live with life-limiting conditions in Ireland; approximately one in five of these children require hospice care. LauraLynn Children’s Hospice is hugely dependant on the generosity of the public and business community to provide care free of charge to families. In 2018, LauraLynn must generate €4.2million through fundraised income. Since opening in 2011, LauraLynn has cared for more than 330 children and their families.